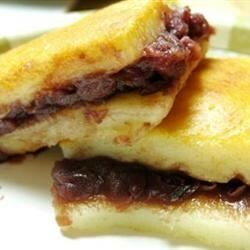 "A sweet dessert made with glutinous rice flour (also called sweet rice flour) and red bean paste. This recipe was given to me by my Chinese sister-in-law. It is a favorite of my family. It has a firm custard-like texture which is different to many western palates. " Preheat an oven to 325 degrees F (165 degrees C). Lightly grease a 9x13 inch baking pan. Mix rice flour, canola oil, milk, sugar, and baking powder in a large bowl. Stir in the beaten eggs. Pour the mixture into the baking pan. Drop small spoonfuls of the red bean paste into the flour mixture about 1 to 2 inches apart, making sure that the red bean paste is covered by the flour mixture. Sprinkle with toasted sesame seeds. Bake in the preheated oven until a toothpick inserted into the center comes out clean, about 55 minutes. Cool in the pans for 10 minutes before removing to cool completely on a wire rack. A fantastic use for leftover rice, this is one restaurant quality dish! Next time, I wouldn't even add the bean paste! When I had it, it was smushy and gooey.... Otherwise, just skip the bean paste and it tastes fine! Great recipe, but a little different from what I'm used to. I added 1 tsp vanilla extract and used half the oil. I also used an entire can of bean paste. Otherwise this is great!